8 years ago I changed my lifestyle completely in a matter of days. I stopped eating fast food and instead started weekly shopping sprees at a local farmers market, I walked at least 1 hour a day, I stopped drinking alcohol and would immediately walk away from someone who was smoking. This sudden change in my lifestyle routine had a purpose. I wanted to get pregnant. While I didn’t know much about fertility, pregnancies and babies, I knew I had to do one more thing – I had to start prenatal vitamins as soon as we started trying to conceive. Normally I don’t plan ahead like this with anything else in my life, but when the goal was a healthy baby I made sure I had a good plan. And I have done this 3 times already. My husband would do the same: eat healthy, stop drinking, exercise more regularly, avoid chemicals and wear boxers :). The only difference was that I was taking prenatal vitamins and he wasn’t. And I never thought about it much until Proxeed plus contacted me and asked to create an open dialogue with our community and share about male fertility supplements to prepare bodies for a healthy conception. And then I had my AHA moment! Prenatal supplements for men! Why didn’t I know about this 3 pregnancies ago?! It makes so much sense. 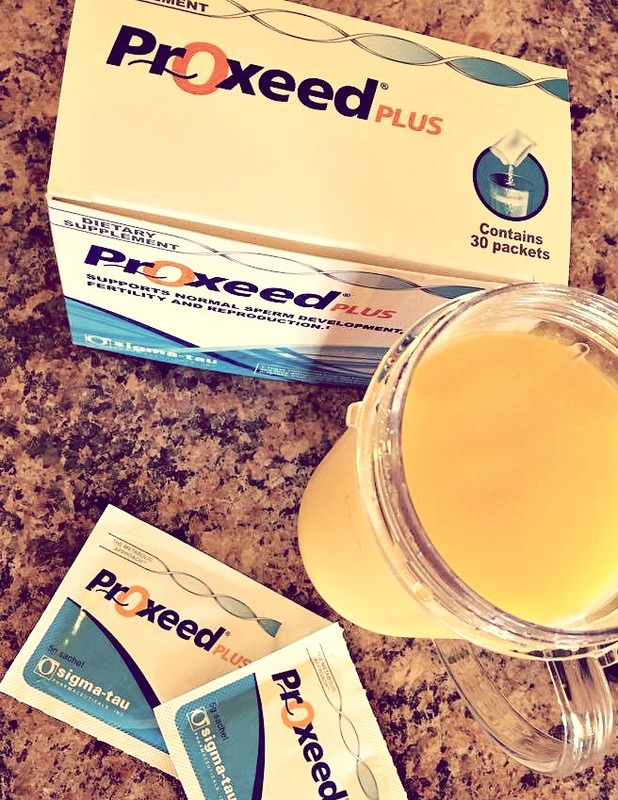 We are not trying to conceive now, but I asked if my husband would try out Proxeed plus for the sake of this review. It was super easy to include the supplements into his daily routine. He put one pack of fruit flavored powder into his morning smoothie or juice. He said it tasted good (he didn’t taste any extra flavor of the powder). It just looked so easy for him to take daily packets of these prenatal supplements, it made me jealous remembering how I struggled to swallow my huge prenatal vitamin every single day. Proxeed plus is a complete carnitine-based formula for male fertility that targets multiple sperm functions, including morphology, motility, concentration, count and linear projection. Proxeed plus is a prenatal male fertility supplement with documented quantities of L-carnitine and Acetyl-L-carnitine; the Proxeed plus formulation contains about three to four times more carnitine than other men’s health supplements. Having carnitines present in adequate quantities helps sperm production and supports male reproductive health. Proxeed plus contains an antioxidant complex and key nutrients needed for developing sperm. Take twice a day, it comes in packets of powder that dissolves easy into water, juice, smoothies or shakes. It has pleasant fruit flavor. It may benefit sperm quality in as little as 90 days. However, for maximum benefit it is recommended that Proxeed plus be taken for six months. So, what do you think? This does make so much sense, doesn’t it? It takes two to make a baby, so why don’t both parents prepare and be as healthy as possible for the future baby. Buy Proxeed Plus (use coupon code “PREP” to use at checkout for $10 off your next purchase).